Retired June 30, 1949. Died September 7, 1961. He entered the US Military Academy West Point June 14th 1911 and Graduated on June 12th 1915, cadet number 5440 and class ranking of 128. 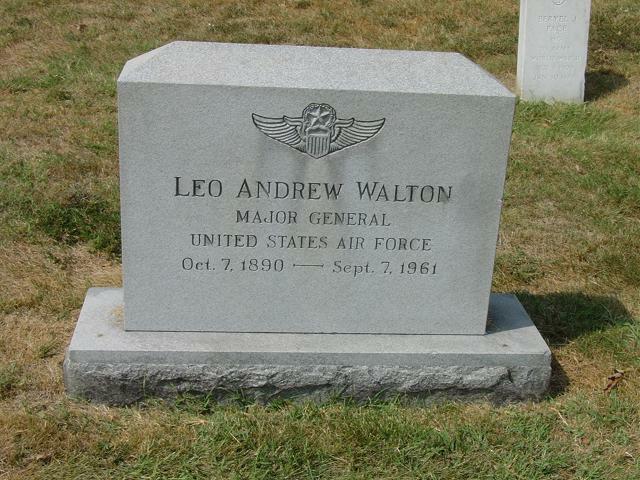 Major General Leo A. Walton, one of the original members of the Aviation Section of the Signal Corps of 1916 and a veteran of World War II, assumed command of the 14th Air Force at Orlando, Florida, on May 27, 1946. Graduating from West Point in the Class of 1915, General Walton's first assignment was with General Pershing in the Mexican campaign. Returning to the United States in 1916, and like his pioneer friends Henry H. Arnold and Carl A. Spaatz, he turned his attention to aviation. He won his wings at Brooks Field, Texas, in August 1917, and returned to that base as the officer in charge of flying in March 1918. On July 1, 1920, he transferred from the Field Artillery to the Air Service. He was assigned to Langley Field, Virginia, in November 1920 to the Field Officers' School. He completed his course in August 1921 and was called to Washington, D.C., for duty in the Office, Chief of the Air Service. In June 1923 General Walton was sent to McCook Field, Ohio, to attend the Air Service Engineering School. Later, in 1924, he was assistant chief of the engineering division at McCook Field. In August 1925 the general was ordered to the Philippines and served as commanding officer of Kindley Field, Fort Mills, Corregidor, and later at Clark Field, where he was station commander and commanding officer of the 3rd Pursuit Squadron, serving in those capacities until May 1928. He then returned to the United States and was assigned to March Field, California, as assistant commandant of the Air Corps Primary Flying School. In September 1937 General Walton attended the Command and General Staff School at Fort Leavenworth, Kansas. He was then assigned to Maxwell Field, Alabama, at the Air Corps Tactical School. In July 1940 he assumed command of the Air Corps Advanced Flying School at Stockton, California. During the outset of World War II, he was assigned to the headquarters of the West Coast Training Center, Santa Ana, Calif., as chief of staff. In November 1944 he was designated as chief of staff of the 6th Air Force, which position he held until early in 1945. He then became chief of staff of the entire Caribbean Defense Command. In July 1945 he was called to China as air inspector of the Chinese theater. For his able and outstanding skill in this capacity he was awarded the Bronze Star. During the early emergency when the Army needed pilots, General Walton, as chief of staff for Western Flying Training Command, planned and executed a streamlined training program. For his foresight and resourcefulness on this mission, he was awarded the Legion of Merit medal. He also holds the Mexican Border Service Ribbon, Asiatic-Pacific Ribbon, Pre-Pearl Harbor Ribbon, American Defense Ribbon and the Victory Medal for World Wars I and II. He is rated as a command pilot and combat observer.